RIDGELAND, Miss. , September 6, 2011… SkyGolf®, maker of SkyCaddie®, the #1 Rangefinder in Golf, today announced that SkyCaddie® SGX™ received the only Gold rating among all GPS rangefinders tested by Golf Digest magazine for the 2011 “Hot List.” The prestigious distinction comes on the heels of a recent survey conducted by Golf Datatech, the industry’s leading independent research firm, who polled serious golfers about their opinions of lasers, dedicated GPS devices and smartphone apps. The study revealed that 94% of all serious golfers believe “exact yardage” is important to their game and when asked which rangefinder, including lasers, they considered the most accurate, the overwhelming choice was SkyCaddie. The combination of golfers’ need for accurate distances and SkyCaddie being named as the most accurate rangefinder explains why more golfers use and trust SkyCaddie for their critical distances than all other distance measuring devices combined. In an article that appears in the October 2011 issue of Golf Digest, SkyCaddie was the only golf distance measuring device to receive Gold rating, the highest recognition from the “Hot List” testing panel, which included Golf Digest editors, golf retailers, golf professionals and consumers. The Golf Digest panel recognized SkyCaddie for its breadth of golfer-friendly features and benefits, including SkyGolf’s unmatched ground mapping process whereby highly-trained SkyCaddie mappers walk every course — just like PGA TOUR caddies do for their pros — using survey-grade equipment with accuracy within a yard or less, to record thousands of points on each hole to verify the exact locations of targets, hazards, fairway run outs, major green contours, false fronts and the perimeter of every green with dynamic front carry and back numbers. That is why more golfers use and trust SkyCaddie than the other trailing brands combined, with SkyCaddie beating the nearest competitor, according to Golf Datatech’s survey, by a margin of 4 to 1. The Golf Digest “Hot List” serves to provide golfers with a guide that they can use as a starting point in searching for new golf equipment. The editors of Golf Digest, along with golf retailers, professionals and consumers spend hours testing all of the newest products each fall. The products that rate the best end up on the “Hot List,” with the very best in each category earning a Gold rating. Edmonson adds, “Whether a golfer has a handicap of 2 or 22, having the right distance is essential for a good shot to end up in a good place. Having the wrong distance information adds another handicap to a golfer who is already challenged enough by a tough game. We achieved this Gold rating from Golf Digest because we believe that golfers of all skill levels deserve the best and most accurate distances possible. Everyone wants to buy a better game. So, when it comes to distances, everyone can be equal if they buy a rangefinder that is reliable and accurate…and it’s clear that SkyCaddie is the right choice. SkyGolf® is a private company specializing in the development of innovative positioning systems and technology products specifically designed for personal use on a golf course. SkyGolf is leading a revolution that is improving the way golfers play the game. The mission of SkyGolf is to respect the long-standing traditions of the game, use technology responsibly and within the spirit and rules of golf, and to provide golfers of all skill levels with better and more rewarding golf experiences. SkyGolf, maker of SkyCaddie®, the #1 rangefinder in golf, is committed to providing the same reliable information a professional caddie provides to PGA TOUR professionals. This unmatched reliability is created by walking every course just like a TOUR Caddie does for a professional golfer, recording critical target information using the only method trusted in professional golf. To date, SkyGolf has traveled over a million miles to ground map using sub-meter survey grade equipment , recording approximately 100 million data points on close to 30,000 golf courses worldwide using their TOUR Caddie ground-mapping methodology. Additionally, thousands of courses are updated annually. SkyGolf believes every amateur deserves the same complete information with the same reliability professional golfers receive and would never play without and believes its SkyCaddie is the closest thing to a Tour caddie’s actual yardage book. The SkyCaddie is the Official Rangefinder of The PGA of America, Canadian PGA, PGA of Great Britain and Ireland , the PGA of New Zealand, PGA of Germany, the PGA of Spain, the Swedish PGA and a Technology Partner of the PGA Learning Center . (FORT WORTH, TX) – UST Mamiya – maker of the world’s finest carbon fiber golf shafts – reports the winner of the Deutsche Bank Championship relied on its Proforce AXIVCore Tour Black shaft in his driver (69 gram, x-flex) and this week added the new Proforce VTS Black in his three and five-woods (both 89 gram, x-flex). The win marks the first PGA Tour victory for the Proforce VTS line, the only shaft collection to include torque as a variable in the fitting process. Each Proforce VTS weight/flex profile includes three torque options, allowing players to match the set-up that best suits their unique swing DNA. Shafts are color-coded to indicate torque rating, with Black featuring the lowest torque, Silver in the middle and Red offering the highest. In his first week with the Proforce VTS, the champion captured his second PGA Tour victory in three weeks. The win adds to the UST Mamiya’s list of titles this season, which include eight on the PGA Tour. Including the winner, six of the top-10 finishers at the Deutsche Bank Championship relied on shafts from UST Mamiya. Widely available in early 2012, consumers can gain early access to Proforce VTS products through the UST Mamiya TourSPX dealer network, which is comprised of a group of highly-acclaimed club fitters nationwide. To find a fitter that carries the line, please visit http://hosted.where2getit.com/ust/attas_tbl.html. With hurricane Irene bearing down on the Northeast U.S., TaylorMade-adidas Golf Tour Staff professional Dustin Johnson notched his second-career FedExCup Playoffs victory at The Barclays on Saturday, charging home with a brilliant final-round 65 to win by two shots. Johnson, wearing new TOUR360 ATV footwear from adidas Golf, was well-equipped to battle the field, and the soggy conditions at Plainfield Country Club. Weather forecasts calling for hurricane conditions shortened The Barclays to 54 holes, but take little meaning away from Johnson’s monumental victory, his fifth career PGA Tour win and first in 2011. It didn’t take long for the TOUR360 ATV, designed to deliver All-Terrain Versatility, to find the winner’s circle; The Barclays marked the official PGA Tour launch of the new footwear. With the win, Johnson moves to No. 4 in Official World Golf Rankings and heads to TPC Boston for the Deustche Bank Championship as the leader in the FedExCup points race. The TOUR360 ATV is available September 2011. See it here. BEAVERTON, Ore. (August 23, 2011) – There will be a familiar iconic shoe showing up on the feet of Nike Athletes Michelle Wie and Anthony Kim. 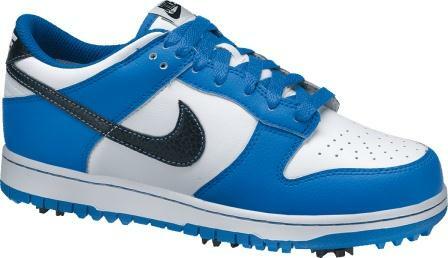 Both young athletes will be sporting the new Nike Dunk (NG) Golf shoe. Wie will debut the colorful shoes at this week’s Women’s Canadian Open and Kim will wear them in the coming weeks on the PGA Tour.
. For international journalists, please contact Nike Golf’s public relations representative in respective countries for information. (FORT WORTH, TX) – UST Mamiya – maker of the world’s finest carbon fiber golf shafts – reports the winner of the PGA Tour’s Wyndham Championship relied on its Proforce AXIVCore Tour Black shafts in his driver (69 gram, x-flex), three-wood (79 gram, x-flex) and five-wood (89 gram, x-flex). Continuing the trend of strong showings for UST Mamiya users, the champion carded four rounds in the 60s while earning his first PGA Tour victory at Sedgefield Country Club in Greensboro, NC. The win adds to the company’s list of titles this season, which include seven on the PGA Tour. Beaverton, OR (August 22, 2011) – Nike Golf athletes Suzann Pettersen and twenty-two-year-old Oliver Fisher emerged as champions at the Safeway Classic and the Czech Open on the LPGA and PGA European Tours, respectively. Both Nike athletes won with a bag full of Nike Golf products, including the new Nike 20XI golf ball and Nike Method prototype putters. Pettersen, who came off of a recent win at the Ladies Irish Open, delivered a stunning performance in the final round by shooting a 7-under-par score of 64 to position her in a sudden-death playoff and overcome a 9-shot deficit. She sealed her victory with a par on the first playoff hole. This is her third win this year with the Nike 20XI–X golf ball and second victory with the new Nike prototype putter. This new Nike Method prototype features a unique mallet shape with a high MOI providing overall stability and performance. It will be available at retail on November 1, 2011. On the PGA European Tour, Fisher claimed his first career victory and displayed nerves of steel by making six crucial birdie putts with his Nike Method putter en route to his two-stroke victory. The Nike Method franchise has been extremely successful on the respective professional tours all over the world having won 26 times, including three PGA Tour major championships. Fisher joins fellow Nike athlete Pettersen as the first professionals to win on the global tours with the new 20XI ball since its North America launch in April. The Nike 20XI ball is scheduled to be introduced at retail globally on February 1, 2012. The 20XI ball features game-changing resin core technology that is faster and lighter than traditional rubber cores. A faster and lighter core results in longer distance and more controlled shots. Both athletes also used the Nike VR Woods, Hybrids, Irons and Wedges. The Nike VR franchise has more than 80 worldwide wins including three major championships. during the week, including a Proforce V2 used by the winner in his 3-wood (86 gram, x-flex). Over the last four events, UST Mamiya placed first or second in both wood and driver shaft counts. New product introductions have catapulted an impressive progression from a fifth-place standing in wood shafts and fourth in driver shafts at the season-opening Panama Claro Championship. Continuing the trend of strong showings for UST Mamiya users, the winner carded four rounds in the 60s at Highland Springs Country Club in Springfield, MO, to capture his first Nationwide victory. The win adds to the company’s list of titles this season, which include six on the PGA Tour. “Pat Dempsey, our Nationwide Tour representative, has excelled in educating players on how our shafts will enhance their performance with clear benefits,” adds Schikner.